Bemis and Murcko outlined a popular method for deriving scaffolds from molecules by removing side chain atoms. A molecular framework can be interpreted as a graph containing nodes and edges representing atom and bond types, respectively. Removing atom and bond labels or agglomerating nodes by chemotype yields a hierarchy of reduced graphs, or molecular equivalence classes, that represent sets of related molecules. Likewise, a framework can be further decomposed into individual rings (or the core ring assembly) using chemically intuitive rules; the rings can individually or jointly be considered as scaffolds derived from the original compound. 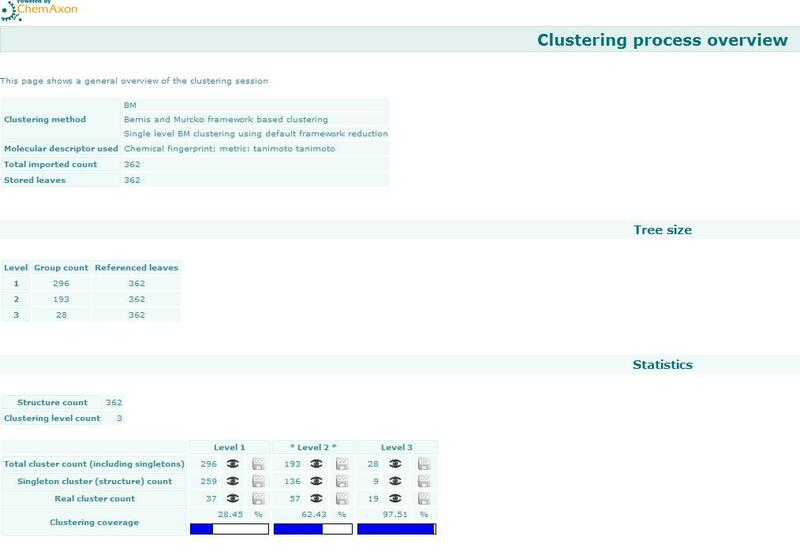 Molecular graph generation ChemAxon applies an extended Bemis and Murcko framework algorithm to generate clusters. The algorithm first generates scaffolds labelled with atom types, and in the subsequent step the atom labels are cleared and a molecular graph is generated. 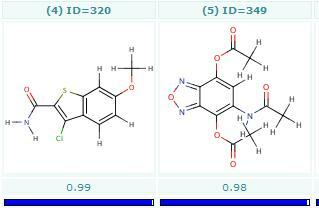 Molecular graph comparison, clustering The methods to compare scaffolds have much variety. Simple numeric metrics or summary statistics based on substructure counts are often used, but these approaches fail to provide much insight into the local and global distribution of similar scaffolds. Topological comparisons using molecular fingerprints or substructure analysis can be done, but they are difficult to interpret owing to the sparse, high-dimensional nature of the data. Graphical representation of the distributions within populations often provides a much more meaningful construction for understanding complex data. Prepare the usage of the jklustor script or batch file as described in Preparing the Usage of JChem Batch Files and Shell Scripts. cat input.sdf | jklustor --o wrclus:smiles:--o wrclus:sdf:frameworks.sdf -o "wrmols:sdf:cluster_*.sdf"
cat input.sdf | jklustor --o "wrmols:sdf:cluster_*.sdf:id-5,15,40-"